One of my close friends, the same friend that introduced me to WVa. dry fly fishing and consequently rodbuilding as a matter of necessity for that first trip, approached me about building a spey rod for the GL region and the bigger waters of WVa.. Corey had always, at least for as long as I had know him, been an Orvis fly guy. 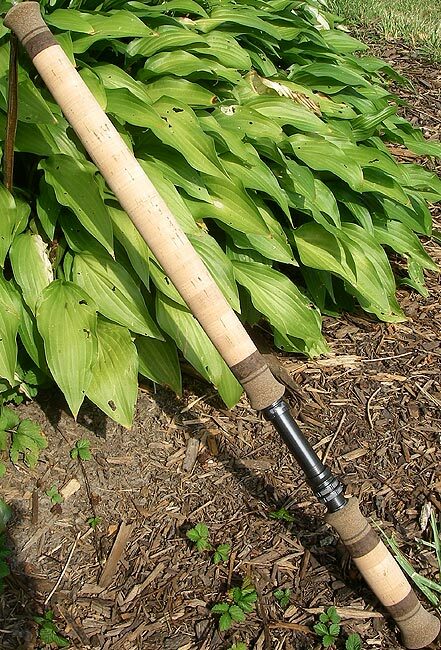 He had some other rods as well, but for the most part Orvis was on most of the rods that saw his casts. 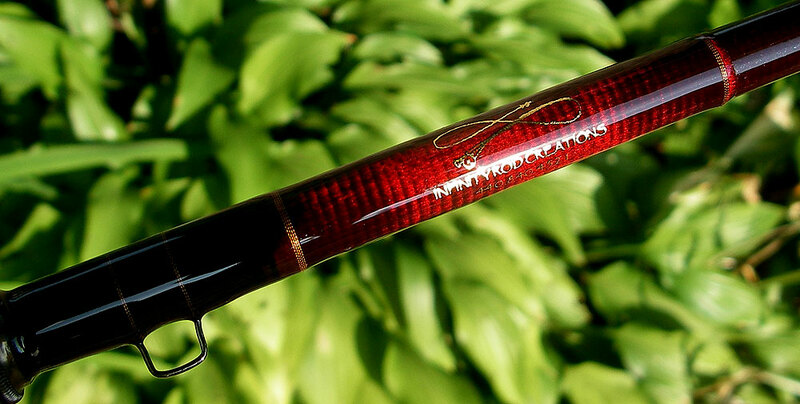 It was gratifying to be asked to build his first custom non-Orvis fly rod. LOL! 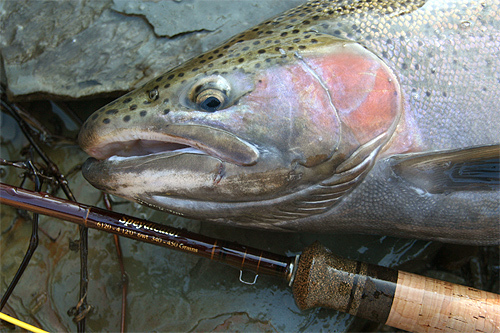 Within the past several years, his attention has changed to spey rods and fishing when pursuing Great Lakes Steelhead. I'm guessing that he enjoys the extended drifts and the initial challenge in learning spey casting. As many fly anglers can attests, indicator fishing is a very effective way to target many species and GL steelhead are no exception. With that in mind, Corey and I discussed a build based on blanks distributed by J. Kuehn's at Angler's Roost Enterprises, specifically the 6/7wt. 12' 4pc. blank in merlot.. It has received some promising reviews from posters on spey forums that Corey frequents. I was 100% on-board and it then became a matter of nailing down the specifics in regards to the myriad of component choices and customization. Corey's proximately to my shop was a great benefit as I called him to stop by a couple times, knowing that he is very particular with certain things, to inspect and/or approve inclusions and progress as they were made. I wish this were possible with all client builds, but I found that 20-50 emails with photos tend to substitute sufficiently for most. 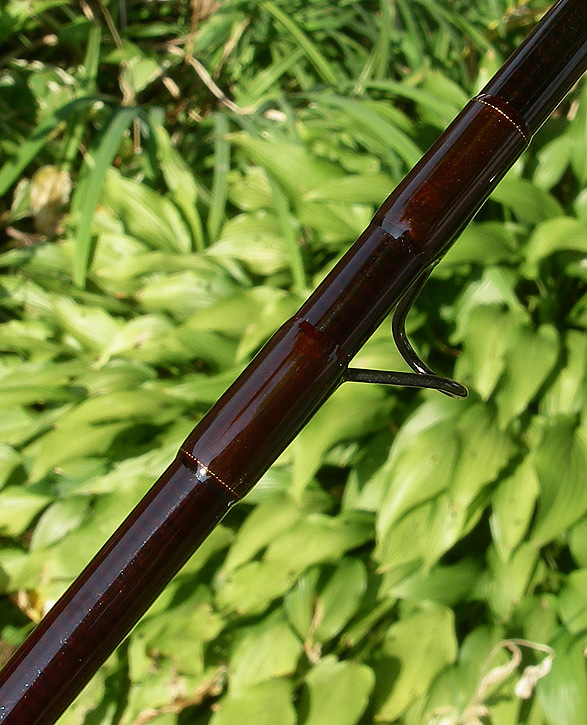 The decision was made to create a rod using a touch of gold accenting (we ended up using bright bronze instead), brown nylon, Tich finished guides to match the Meiser reelseat that was provided and an understated, elegant and simplistic beauty. It is no secret that I take issue with simplistic builds. This is not because I enjoy contradicting my client's wishes, but only because when I sit down to create something special for someone, I WANT IT TO BE SPECIAL! I'm very agreeable if the design motif works, but if an avenue presents itself to enhance the base look and thus add a little "WOW" to it...I'm going to press that it be included as was the case with this build. The original grip design included end caps of rubberized burl, framing 1/2" burnt cork rings and all natural cork in between for both the fore and aft. This was mocked up on a turning mandrel and presented to Corey for approval. He liked it and I'm sure it was exactly as he had envisioned, but to me....well, something was gnawing at me and I couldn't let it go. It was too simple, IMO. Finally, after keeping quiet as we discussed other areas of the rod, I pressed for more dazzle in the grip. I made some suggestions and Corey thought the last one had potential. I mocked it up on the spot and the final grip is the result of this "compromise" on both our parts. Let's call this first "compromise" the cause of a domino effect as the guide wraps started to bug me. The initial design would look great and ended up being the wraps on the upper mid and tip sections, but for the stripper guides, I had other plans. 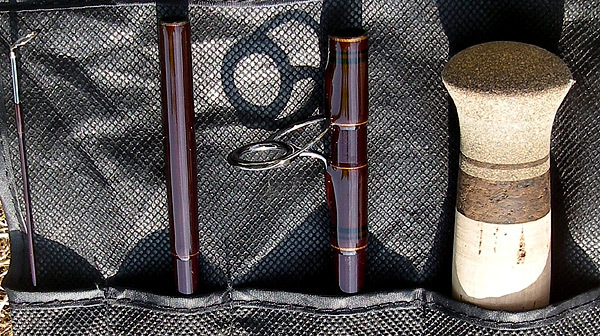 I really thought it would look great to include the same motif followed in the grips into the wraps of the hook keeper and the three stripper guides on this light spey rod. So, I pushed to include black thread into these areas in the same pattern as the burnt exotic cork found in the grip ends. The thread used, chestnut nylon without color preservative presented an issue that was overcome by wrapping the gold trimbands and black bands separately as stand alones, thus preventing "tag end" show-through when the main thread turned translucent. The look worked and I hope you'll agree that the inclusion added just enough uniqueness to remain both subtle and classy, but well short of plain-jane. 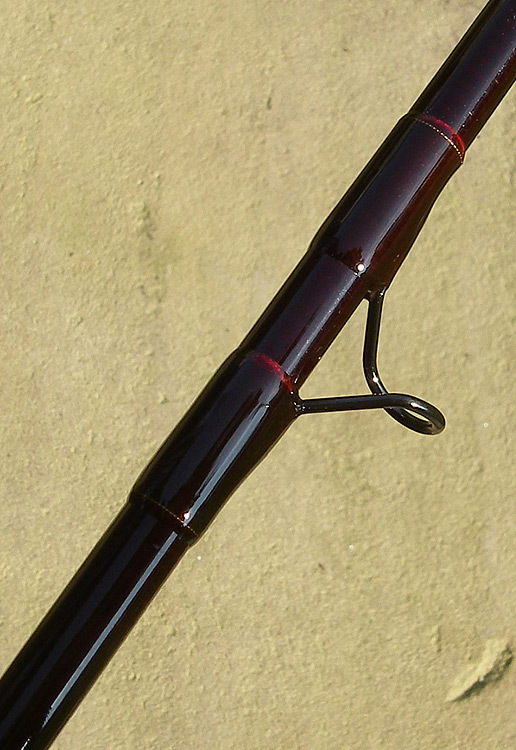 Corey and I both agreed, the wraps on the ferrules would be long as spey casting is brutal to the joints of the blank. The extra length will hopefully at an additional level of strength as the wrap covers the entire male end of the blank's area inside the female ferrule. 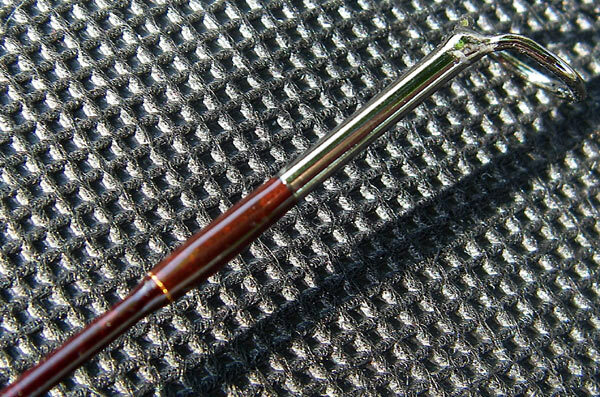 Finally, a 30" marker was made using two wraps of the bright bronze metallic thread. Wrapping this is a small challenge, but putting finish on such a narrow band is another story. The finish application was mastered using a dubbing needed, a steady rest clamped to the wrapping table and the absence of caffeine in my system several hours prior to coating (LOL!). The TiCh running guides were oversized, as specified, to help with ice up conditions. Stripper Guides: PacBay TiCH, Model "T"
I really liked building this rod. I put the same amount of passion into it as all the rods that come off the bench, but knowing that it was headed to a long time friend made it that more special for me. I know it'll see much use this coming season and I look forward to seeing the awesome images as Corey has made a name for himself as an accomplished amateur photographer!